Drinkwel Review: Can this Supplement Solve Hangover Issues? Home » Hangover » Drinkwel Review: Can this Supplement Solve Hangover Issues? Alcohol is part of our culture, it helps us celebrate and socialize. But drinking too much on a single occasion or over time can have serious consequences for our health. Alcohol abuse can damage organs, weaken the immune system, and contribute to cancers. On the other side, some people actually may benefit from drinking alcohol in small quantities. If you still can't avoid taking in large amounts of alcohol and get those annoying hangovers in the morning, you may need supplements to take care with that. Let us find out in this Drinkwel review if this supplement is the solution for your hangover issues. Alcohol can cause your neurotransmitters to relay information slowly, so you might feel drowsy. Alcohol-related disturbances to the neurotransmitter balance can trigger mood and behavioral changes, including depression, memory loss, and even seizures. Drinking too much can weaken your immune system, making your body a much easier target for disease. Chronic drinkers are more liable to contract diseases like pneumonia and tuberculosis than people who do not drink too much. Drinking a lot on a single occasion slows your body’s ability to ward off infections, even up to 24 hours after getting drunk. Why cut down your alcohol intake? By drinking less you could get rid of complaints such as diarrhea and indigestion because alcohol irritates the stomach and produce more acid, which can cause gastritis. Cutting down on alcohol will reduce your risk of developing cancer, liver or heart disease and could lower your blood pressure. You may not be able to see the difference you’re making, but by drinking within the government's low-risk unit guidelines, you can be confident you’re doing your body a massive favor. Most drinkers know that the liver is responsible for filtering and processing the alcohol, but they’ve also included antioxidants that are meant to cancel out free radicals, as well as vitamins for energy and a healthy immune system. Drinkwel is a product intended to be a daily multivitamin. Drinkwel Vitamins are made to be taken daily, even when you’re not drinking, and you are supposed to take an extra dose of it before you sleep after a night of drinking. The ingredients used are supposed to help keep your liver healthy and functioning properly and help it digest and process the toxins. Drinkwel claims to cure hangover for people who loves to drink alcohol excessively. As it claims that its ingredients will help replenish nutrients, support healthy liver function, and help your body process alcohol-induced toxins. So what is in Drinkwel? EDITORS TIP : Check Out Remedy instead for a better result. I am a heavy drinker. I bought the item before heading to Club for a week. I did not wake up with a hangover at all. I have always suffered from hangovers before whether it was by feeling lethargic, or with a slight headache. But with Drinkwell I even woke up and worked out a few days out of the week. Highly recommend!!! I have been an avid user of Drinkwel having discovered it just a few months ago. I also make a point to share this product with people around me because I do want them to drink healthier. When I saw Revil, I had to try it. This was a brand that I trusted so I couldn't wait to see the results. Drinkwel has performed miracles. I've woken up bright and chipper after office holiday parties, heavy day drinking that turns into night drinking, wine-fuelled dinners. You name it. If I take Drinkwel before I go to bed, the worst I will wake up with is a headache, and that is far easier to fix than a hangover. The hardest part is remembering to take it before you go to sleep. These pills are amazing! I won't say that these pills alone will cause you to not have a hangover but they most certainly prevent it and make the morning after significantly better. The instructions recommend that you take 3 capsules at a time but I generally take one before I start drinking, one before I go to bed, and maybe one in the morning if I had drunk a lot. With each capsule, I make sure to drink at least one large glass of it. THIS IS THE KEY! Drinkwel doesn’t really make a massive claim. The manufacturers tend to present the product to be just a multivitamin. Drinkwel would probably be best for heavy drinkers who might not take their health very seriously and use this product as a way to get those vital nutrients and remove the toxins. It’s a vitamin for alcohol drinkers, rather than an aid for hangovers. But for most users who thought that it would be the best remedy, unfortunately, Drinkwel provided no results and it had them the worst condition of a hangover. Milk Thistle and Artichoke to support healthy liver function, protecting the hepatocytes (liver cells) and promoting healthy detoxifying. Amino acid N-Acetyl Cysteine and Taurine to assist the body in metabolizing alcohol-induced toxins. A full Vitamin B-Complex to aid metabolism and maintain energy. Vitamin B6, Folic Acid, Vitamin B12 and Biotin all help support normal energy levels. Superfruits such Acerola, Goji and Acai that help neutralize free radicals. These berries have antioxidant properties that support healthy liver metabolism and detoxification by scavenging free radicals. There are no known side effects if administered correctly. Yes! This product meets the strict safety standards of dietary health and supplements Act and the Federal Food, Drug, and cosmetic Act. Can I take Drinkwel even if I am taking other medication? Each person is different and we recommend you speak to your physician before taking our products, especially if you are taking medications. No, it is not. 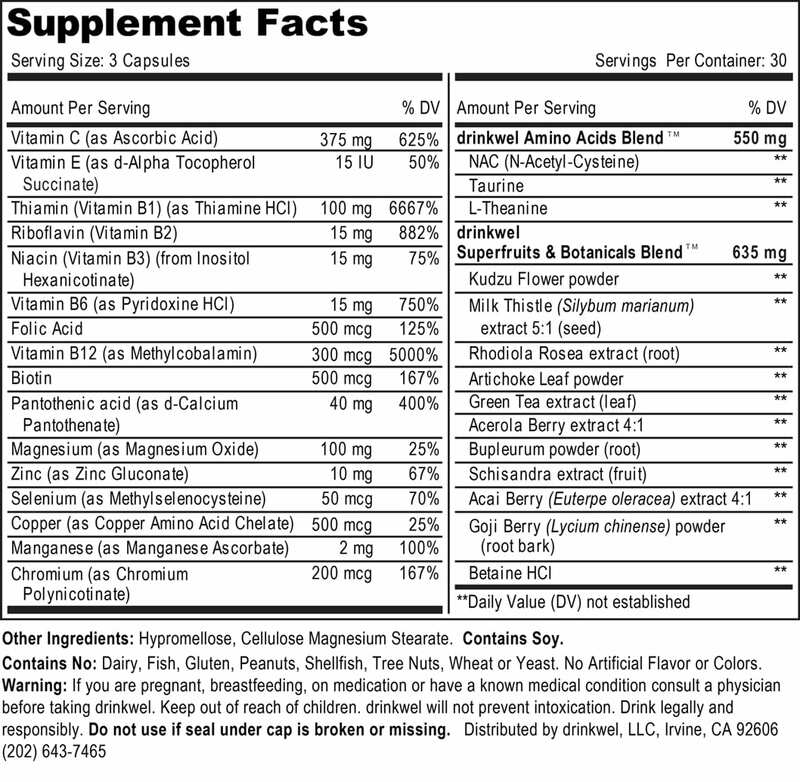 This product is a dietary supplement. Are your products regulated by the FDA? As dietary supplements, our package labelling, ingredients and manufacturing quality are regulated by the FDA pursuant to the Federal Food, Drug and Cosmetic Act. You should take 3 capsules every day. After you drink alcohol, you should take an additional 3 capsules before bed. Blowfish For Hangovers Review: Is This A Legit Cure For Hangover?